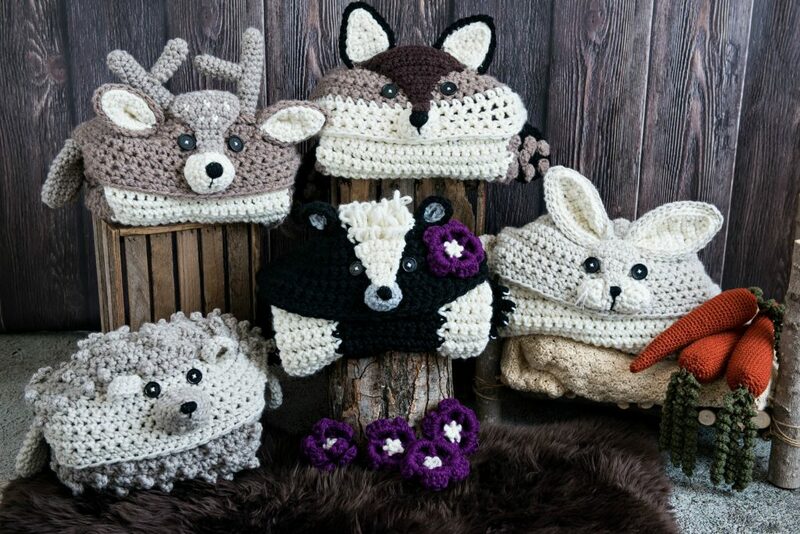 The Woodland Collection continues to grow! 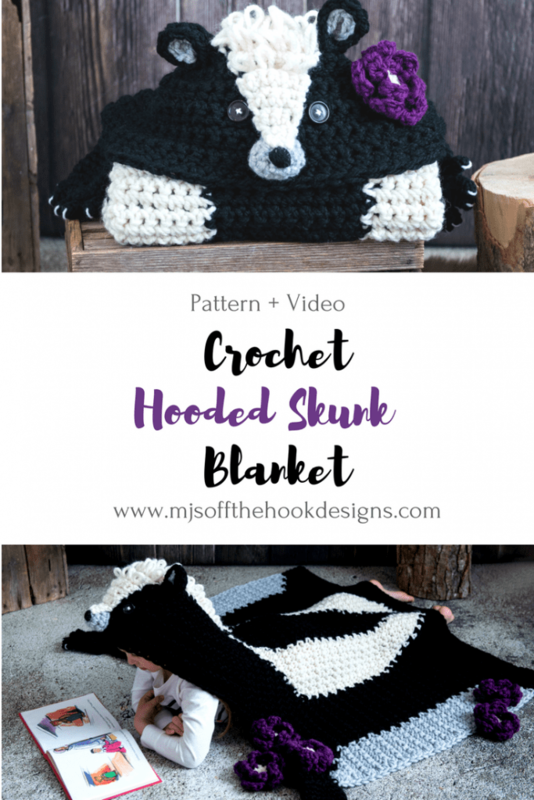 We’ve just released the Crochet Hooded Woodland Skunk Blanket. 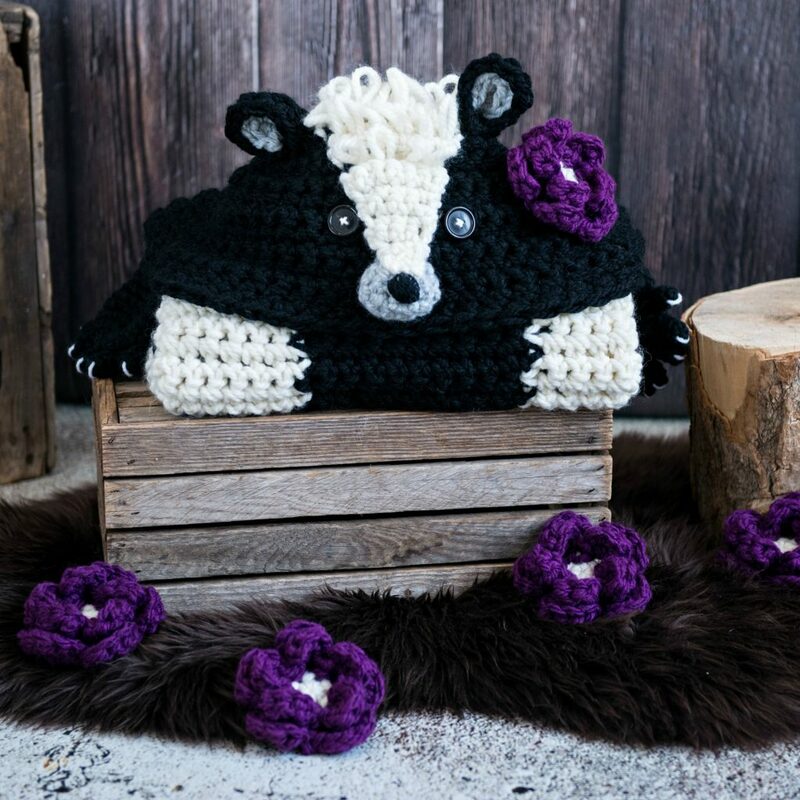 This little guy will warm the skunk lovers heart! He’s as cozy as he is cute. We’ve graphed an extra large size tail onto his back and gave him a gorgeous loopy stitch maw-hawk hood. 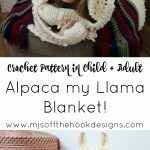 Kids can’t have all the fun so all my blankets include Adult sizes too! 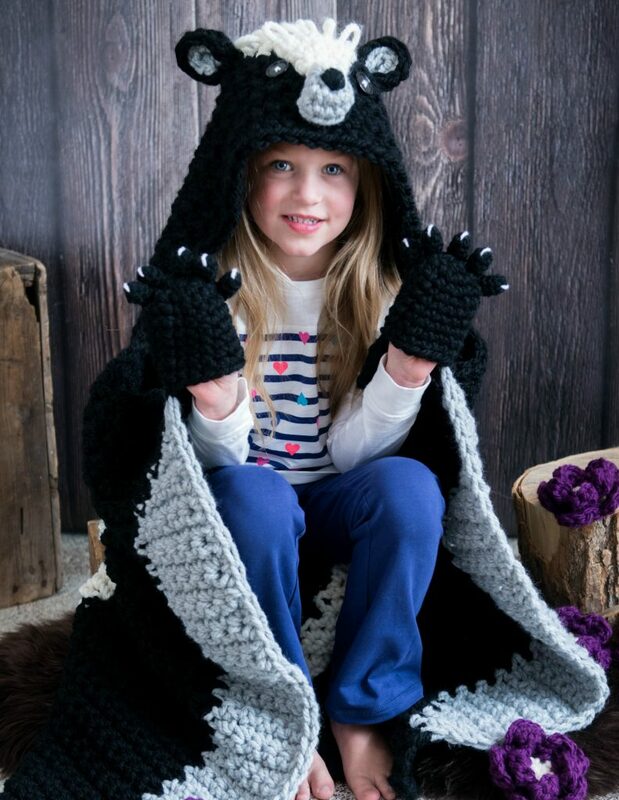 When it’s time to stash your blanket away fold it up and tuck in the hood for a cute pillow to display. To get started you’ll need to order some yarn. 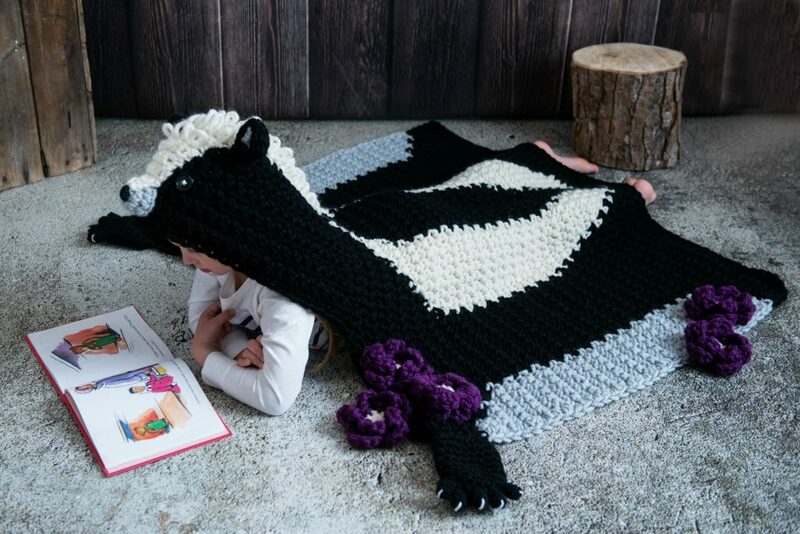 These blankets are made using 1 strand of Super Bulky. Sprightly Yarns Super Bulky Acrylic Wool is super thick so 1 strand is all you’ll need for a bulky cozy blanket. 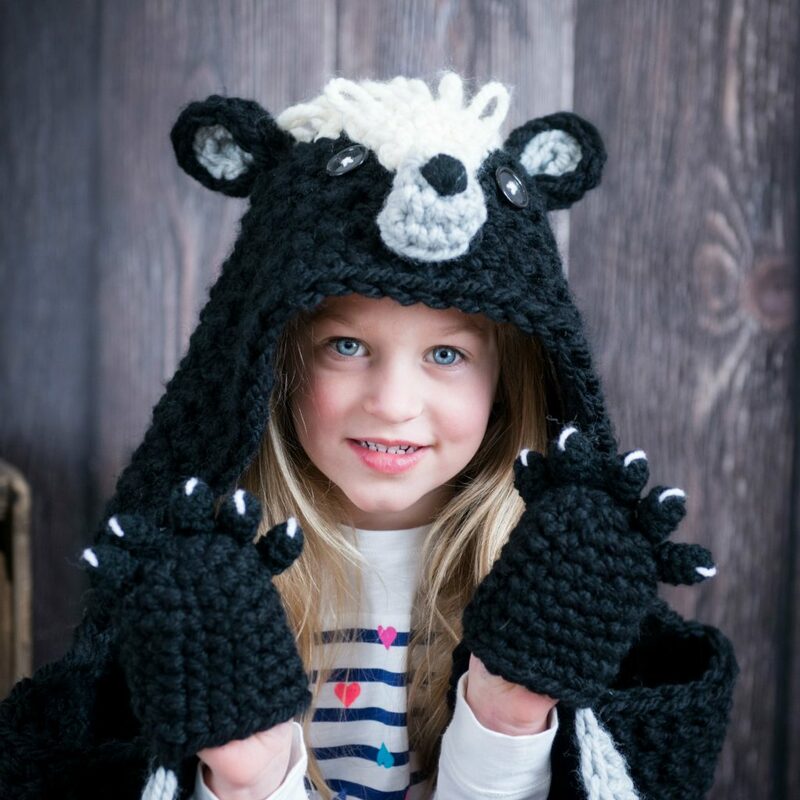 Sprightly is Exclusive to Craftsy and can only be purchased online. The best alternative to this yarn is Lion Brand Wool-Ease Thick & Quick. You can purchase online here or find in many local stores. 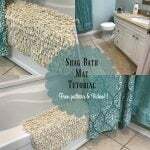 from: Orchard Yarn & Thread Co., Inc.
For those of you that love Bernat Blanket yarn it will work great too! You’ll also need a 16mm crochet hook to whip you through this design. I love Susan Bates hooks! This is my favourite hook that I use for all my Bulky & Quick blankets. For all the little details you’ll also need a 9mm and 4.5mm crochet hook. Also some scrap worsted weight yarn in black and white. 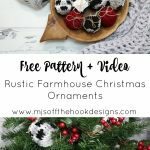 Buttons are used for the eyes to give this collection a rustic and old fashioned look. 25-30mm size is just perfect. I prefer a 4 hole button to get the X shape when you sew them on the hood. I hope you enjoy making this design! 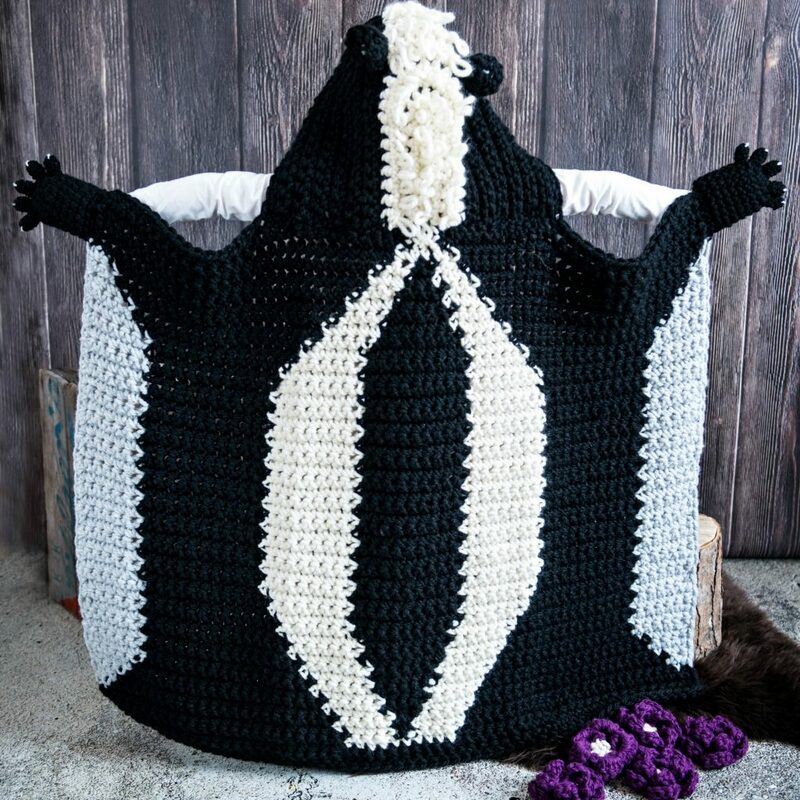 You can grab the pattern now HERE. Keep an eye out for the Hedgehog joining our collection soon! 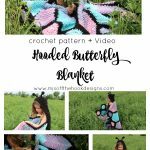 For an Easter discount use coupon code EASTER15 and save 15% off all patterns until April 3/18 11:59 EST in our RAVELRY shop. Also use coupon code WOODLAND on your purchase of any 4 woodland blankets to receive the 4th for free! Coupons cannot be combined.